After a nice extended weekend in Barcelona, it was time to head back home. 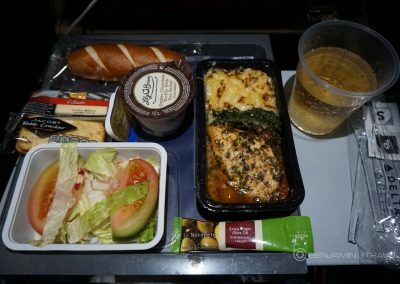 We’d flown Air France on the outbound journey and had a less than great experience. I wasn’t quite ready to go home after such a short visit to Barcelona but alas it was back to work. 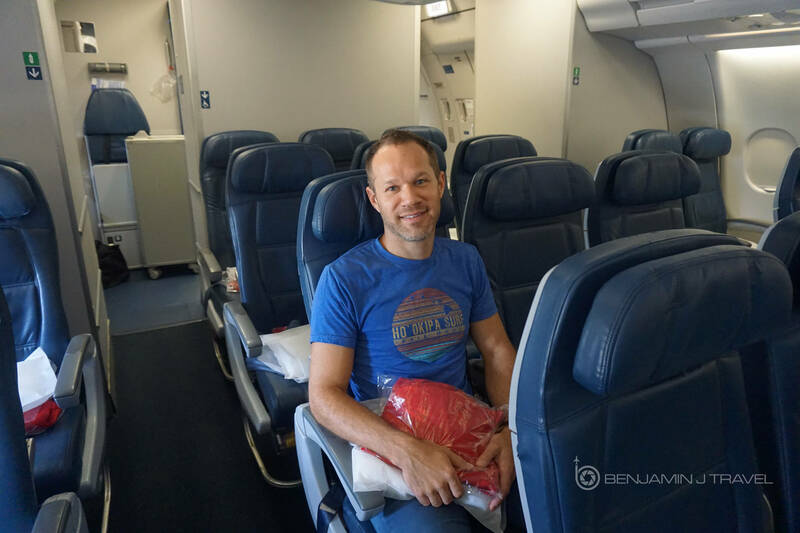 As part of our super cheap SkyTeam fare we scored for this trip, our return flight was aboard Delta’s A330 Economy Class via JFK. 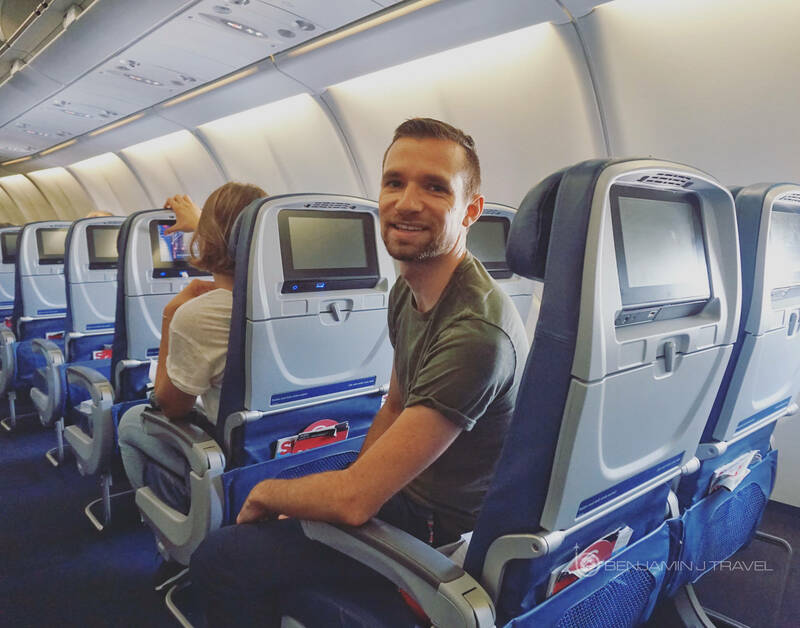 We took the metro to Barcelona–El Prat Airport which took about 40 minutes from our hotel in the Les Corts neighborhood. The metro station in Terminal 1 puts you directly below the departures level. We arrived at the airport about 90 minutes before departure but our flight was not listed on the check-in board so we didn’t know which aisle to head to. I felt like it was a bit late for our flight to not be posted yet so we just walked down a few aisles until we happened to encounter the Delta check-in counters. We used one of the self-check kiosks to obtain our boarding passes since we weren’t able to download them to our phones. I noticed our seats had been moved contrary to anything I had done. We were now in aisle seats, 1 row apart. It wasn’t that big of a deal as Chris and I both are adults and can sit apart on a plane. 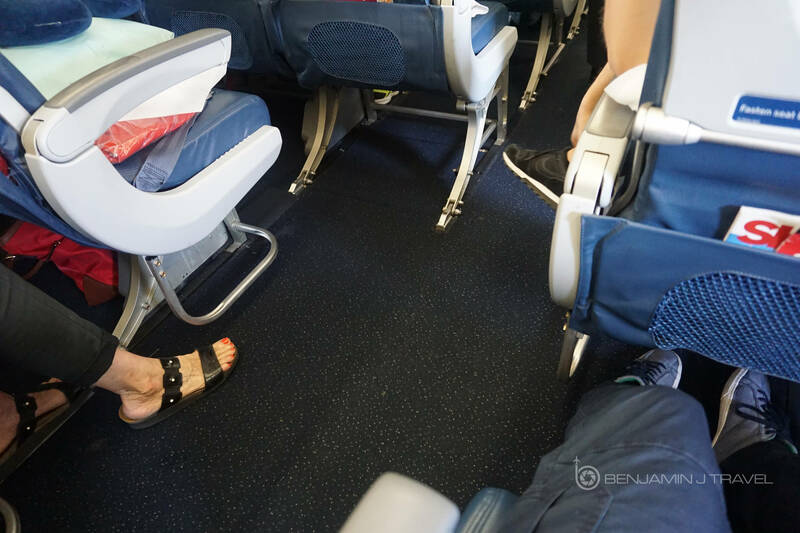 But considering this seems to happen from time to time, specifically on Delta, I was annoyed. 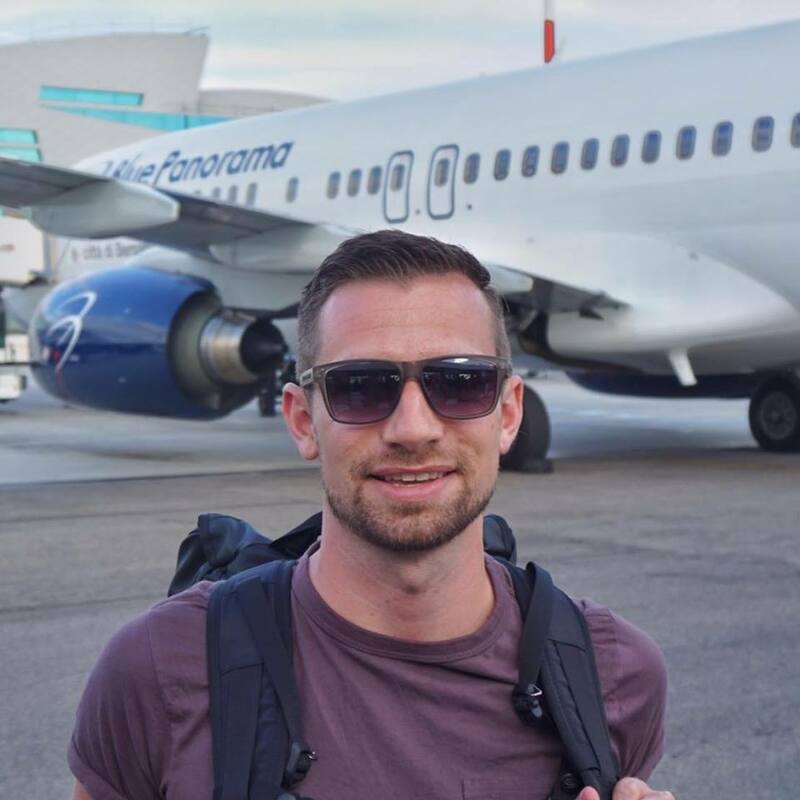 The check-in agents politely stated there was nothing they could do. When we had arrived at BCN on the outbound, we noticed there was a lot of shopping in the terminal. We had planned to check out some of the shops before our return departure but we discovered this was for Schengen-zone flights only. Therefore, shopping wasn’t going to happen for us. We cleared passport control and headed to concourse E where mostly US-bound flights depart. Unfortunately we discovered that there is almost nothing beyond passport control in Concourse E: one cafe, a duty-free shop, and a restroom. We hadn’t eaten breakfast so I stood in line for 20 minutes at the cafe to grab a couple of baguette sandwiches. About 45 minutes before departure time, our plane began the boarding process. 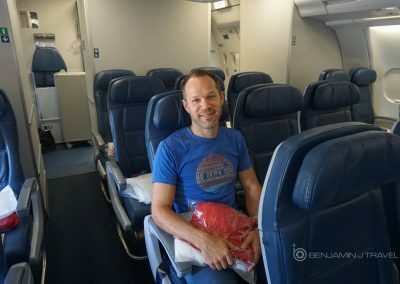 I have no status with Delta but I do have the Delta Amex Platinum card so we did receive Zone 1 boarding. 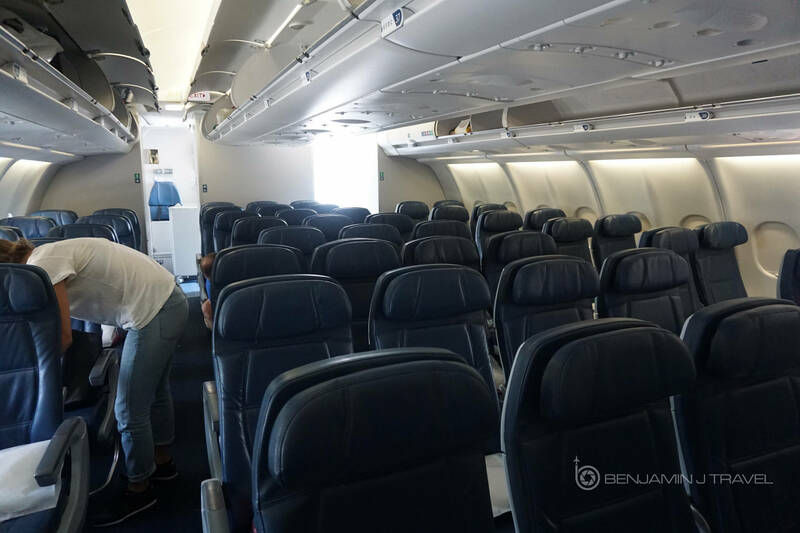 There were very few elites on this flight so after Business Class, we were one of the first couple of passengers to board in the main cabin. 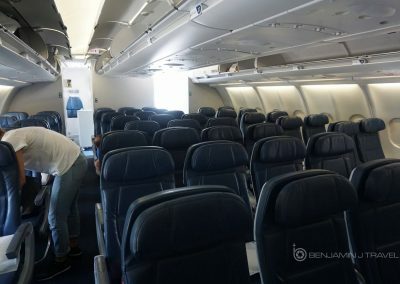 We headed down the jetway and boarded through door 2L onto our Airbus A330-300. 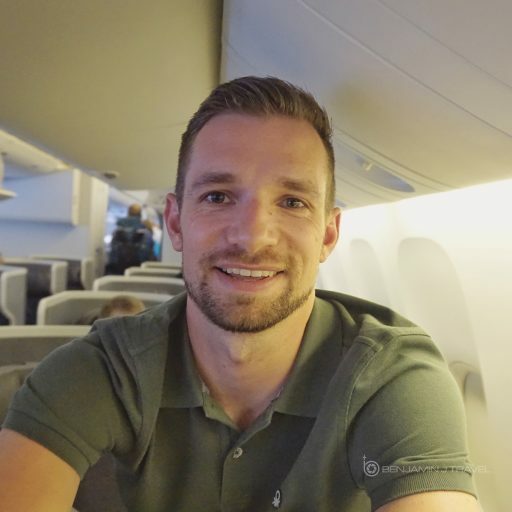 We were seated near the very rear of the Economy cabin, myself in 40H and Chris is 41F. 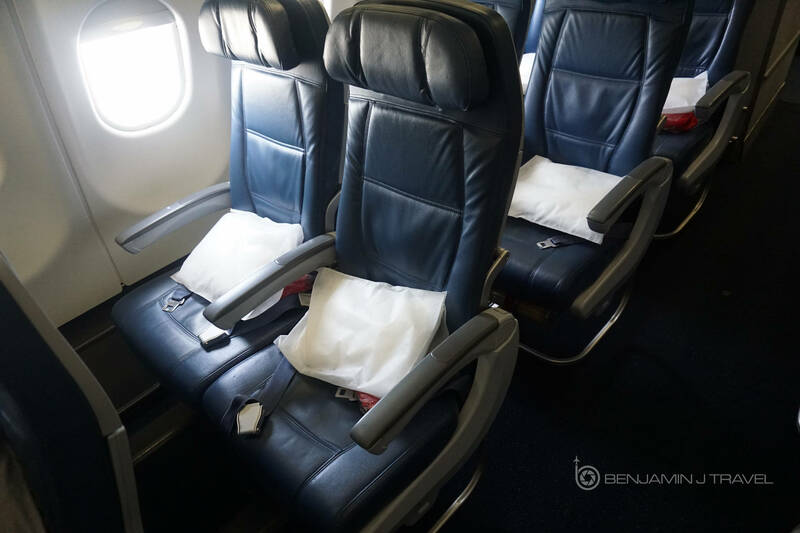 There were almost no other passengers in the rear Economy cabin for quite some time so we have plenty of time to settle our bags into the overhead and get comfortable. 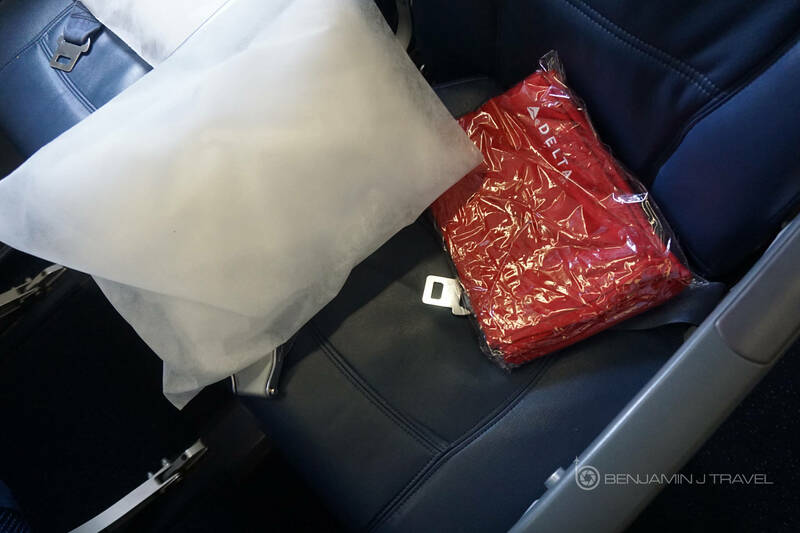 On our seats were a pillow and blanket. The majority of the Economy cabin is in a 2-4-2 configuration. However, near the rear of the plane where we were seated, the configuration narrows to 2-3-2. This creates a bit of extra “leg stretch” room as the aisles are wider in the rear of the plane thanks to the angle of the rows. 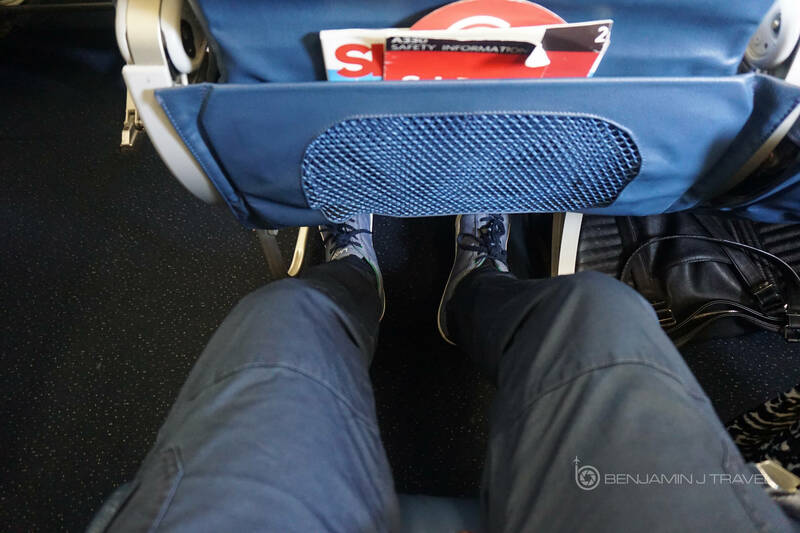 Legroom is a standard 31″ in standard Economy seats. 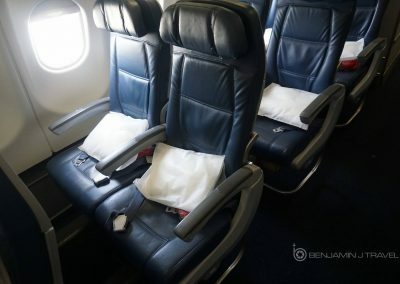 The leather-upholstered seats on the A330 have an average recline. Boarding went fairly smoothly and we were soon ready to push back close to on-time. We were soon in the air and reached our cruising altitude. 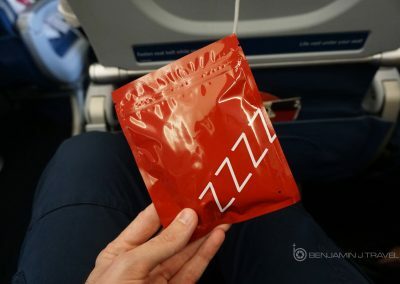 Shortly after the seat belt sign was turned off, the crew walked around offering headphones and eye masks and ear plugs. 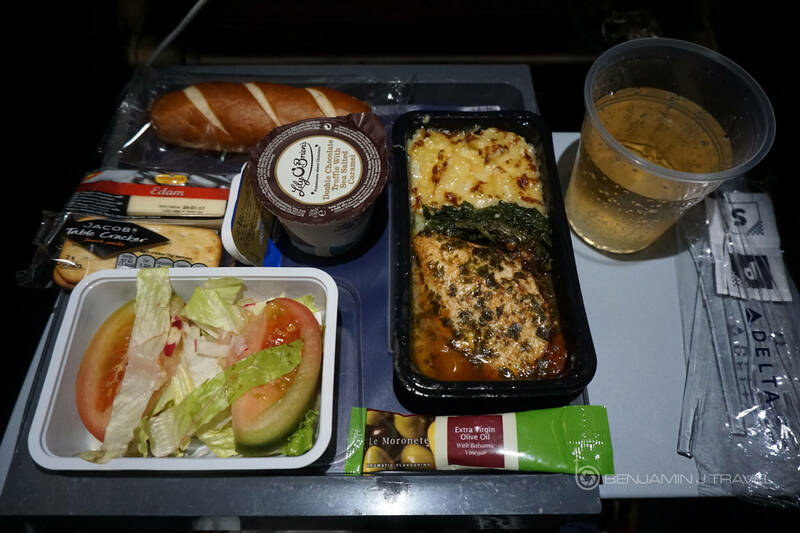 About 45 minutes into the flight, lunch service began in the Economy cabin. A pasta and chicken option were offered and Chris and I both opted for the chicken dish. The presentation wasn’t much but actually it was quite good for an Economy meal. The side salad was beyond forgettable but the chicken with spinach was quite good. Drinks soon followed once more after the meal. The cabin crew was cordial but not overly friendly. A passenger in front of me starting giving attitude to the crew about the ingredients in the meals. I wondered why he didn’t order a special dietary meal in advance. About 30 minutes later and the cabin began to quite down as most passengers began to nap or watch movies. 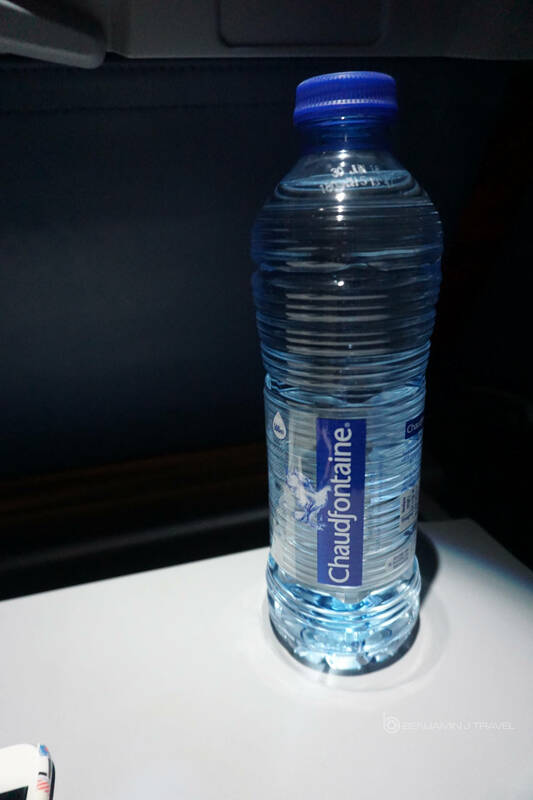 The crew handed out full-size water bottles to all passengers which I think is great. 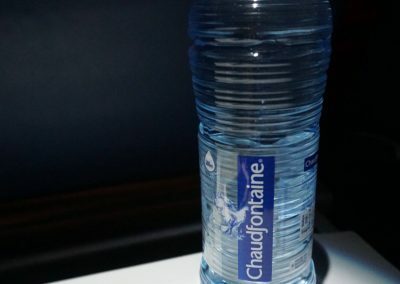 Some airlines don’t hand out bottled water at all in Economy. I decided to spend some time catching up on work so I logged onto the Gogo WiFi. 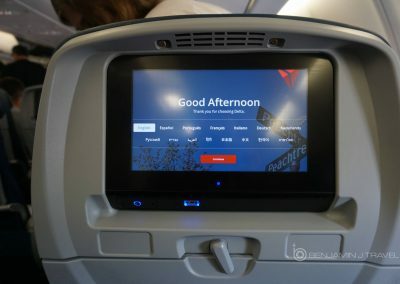 One thing I appreciate about Delta is the consistency of WiFi across almost their entire fleet. For international WiFi the speed was decent and the connection stayed fairly consistent. It was however, more expensive than American’s international WiFi by at least $10. After spending about 90 minutes on some work, I decided to catch a bit of a nap. I dozed off for at least a full two hours if not more. 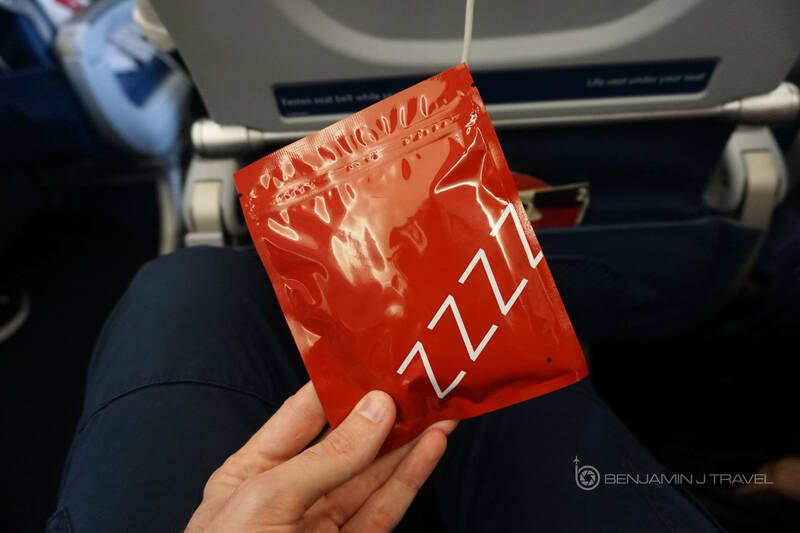 As I awoke, the cabin crew was handing out ice cream as a snack, about the halfway point through the flight. 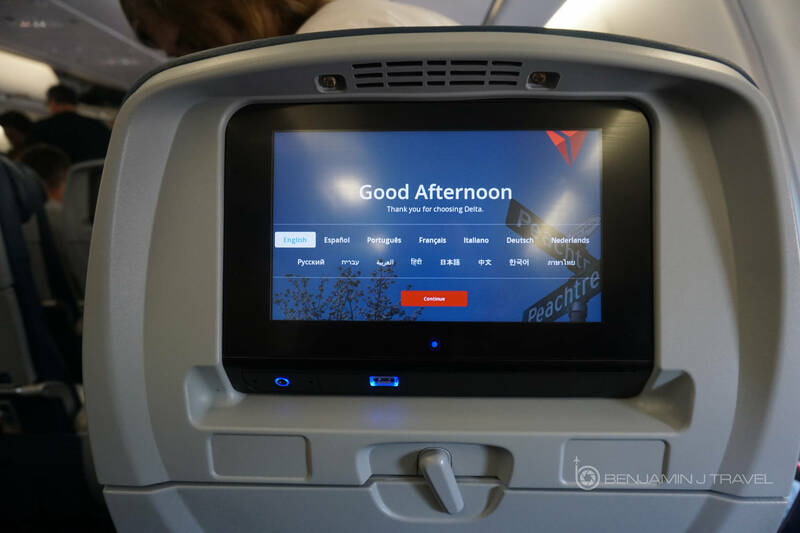 After the snack, I spent a bit more time watching a bit of TV on the IFE and napping after that. 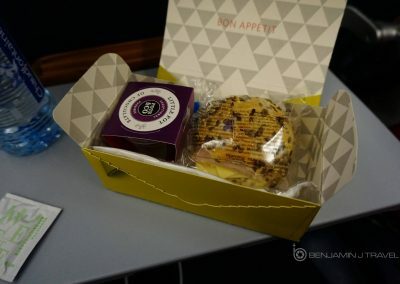 About 90 minutes before arriving in New York, the pre-landing snack was served along with beverages. 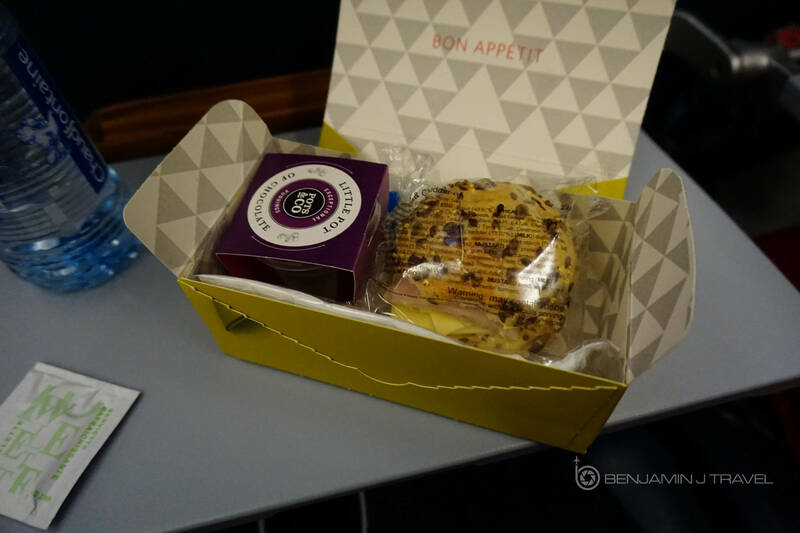 Most US airlines serve “snack boxes” rather than tray meals on westbound transatlantic flights. It included a bland chicken sandwich and a small chocolate desert. The passenger in front of me once again caused a commotion about the meal options for his diet needs. But this time he was blatantly obnoxious and rude to the crew. I am understanding of those dietary needs but this just wanted to be a prick. About 20 minutes before landing, final snack and trash items were collected from the cabin and we began to descend into JFK. We touched down just a bit ahead of schedulea and our taxi was nice and short. We deplaned at Terminal 4 and the crew wished us on our way. 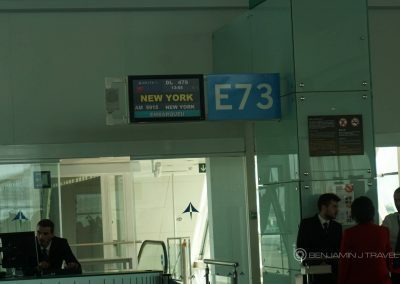 Terminal 4 was packed with many arriving international flights. Global Entry helped us cleared customs in no time however, despite the massive crowds. On our outbound flight, Chris had TSA PreCheck but I did not. Now on the return, it was the opposite: I had TSA PreCheck was but Chris did not. I feared Chris would be forced into the standard security queue and we’d have to endure very long lines. To my surprise, there was only 2-3 people in the TSA security queue and I was able to keep my shoes on with my TSA PreCheck boarding pass. Soon, we were on our way to our connecting flight to Dallas. 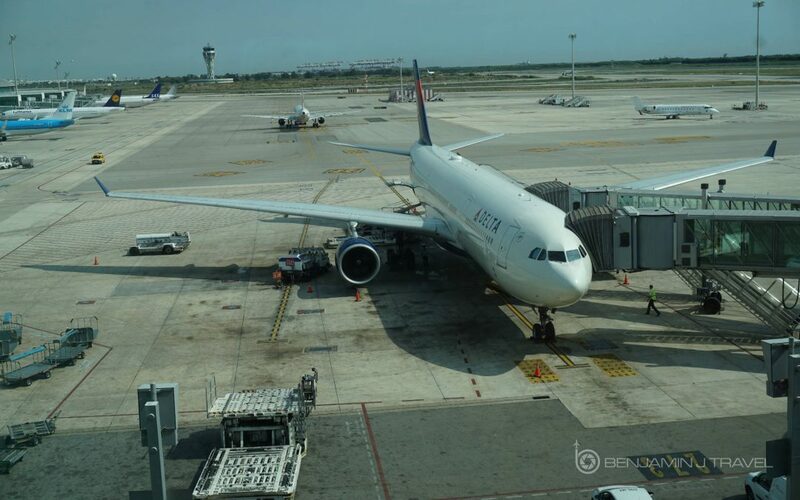 While I’m no regular Delta flyer these days, we had a relatively pleasant flight from Barcelona to New York. The crew was generally friendly but not necessarily remarkable. The food, or at least the lunch service, was quite tasty for Economy and I appreciated the full-size water bottles handed out. I will applaud Delta on offering a consistent A330 Economy class experience, at least on the flights I’ve been on. And considering the super cheap ~$400 USD roundtrip fare we paid for our Dallas to Barcelona, I can say it was money well spent.